Northern England has suffered massive flooding over the past weeks. Thousands of people have been evacuated from small towns and big cities like York and Manchester. 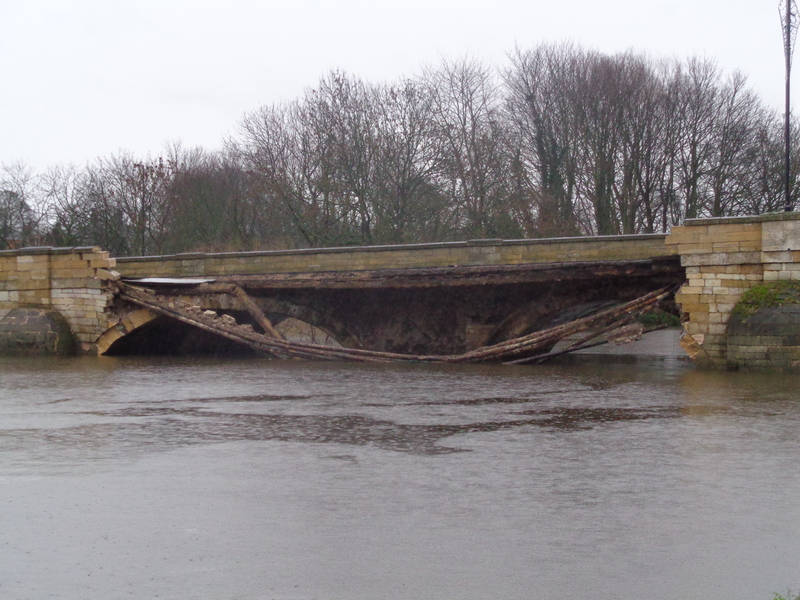 One of the small towns, Tadcaster, 10 miles southwest of York, has lost a large section of a historic stone bridge to the flood waters. Bystanders captured dramatic footage of the moment of collapse. The bridge was closed to foot and vehicular traffic after the River Wharfe began to flood on December 26th due to fears that the rising waters had caused structural damage. Obviously that was a wise precaution because on December 29th the bridge started coming down. The collapse of the bridge formed a dangerous wave — you can see it in the video — and authorities asked all residents in the area to evacuation immediately. Also, gas pipes threaded along the bridge were exposed in the collapse. Witnesses and journalists watching the events smelled a strong smell of gas right after the stones fell down, so an area of 150 feet around the bridge was cordoned off to deal securely with the gas leak. Residents were allowed to return to their homes the next day. 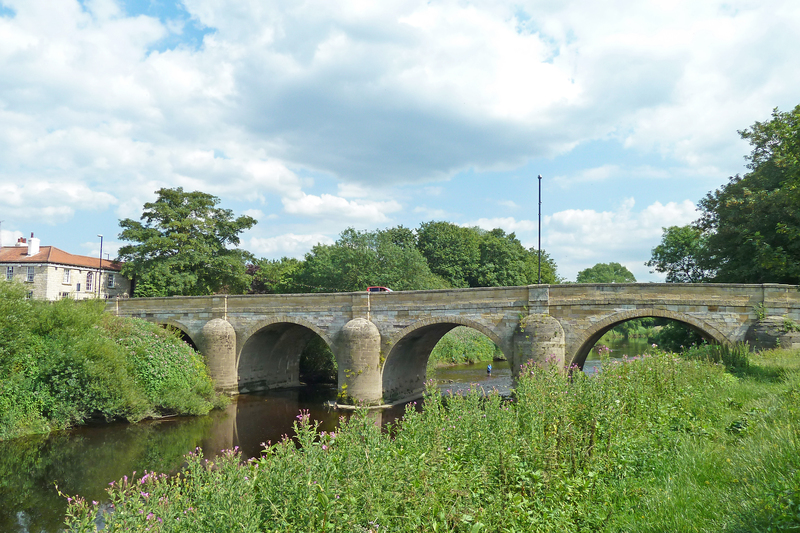 The Tadcaster Bridge, also known as the Wharfe Bridge, was built around 1700 in the same location as an earlier bridge built around 1200 of stones purloined from Tadcaster Castle. Its seven bays are made of Magnesian Limestone, a local stone that has been quarried in the area since Roman times (Tadcaster was called Calcaria back then, the Latin word for lime) and is still quarried today. It is Grade II listed as a structure of significant architectural or historic interest. The bridge is the main road connecting to halves of the town. 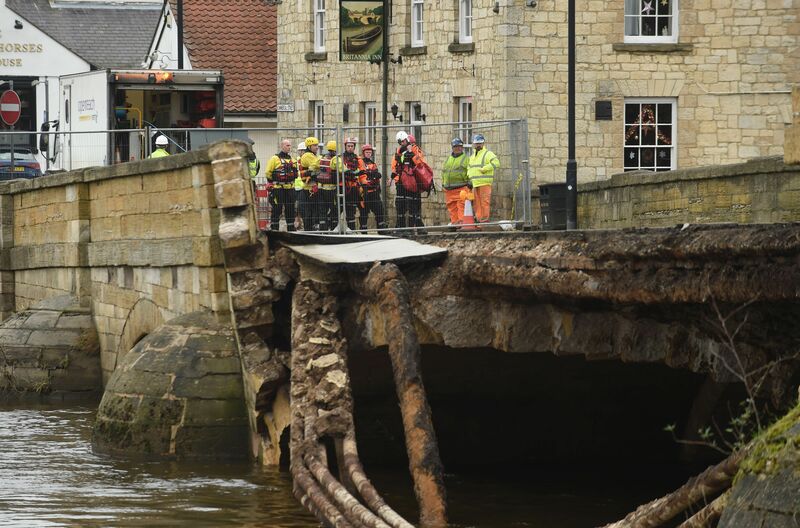 Only one bridge remains now — a modern one for the A64 bypass — and it’s on the other side of town so locals have to go six miles, 12 roundtrip, out of their way to cross Tadcaster town center. And that was just the aftermath of Storm Eva. Frank is on the way now. This entry was posted on Friday, January 1st, 2016 at 1:43 PM	and is filed under Modern(ish). You can follow any responses to this entry through the RSS 2.0 feed. You can skip to the end and leave a response. Pinging is currently not allowed. Just a point of interest, did the bridge collapse along the line of ‘recently’ installed electrical and communication cables? Interesting comment by Ian, a follow up question could be how many times have holes been dug to repair or upgrade etc. since? Also, before the bypass was built a good many heavy vehicles would have bounced across it. Perhaps some of the bigger ones since. I knew Taddie quite well, being a worshipper of Sam Smith’s, and my guess is that the bridge has been at risk for a little time now but has not had any priority. Thank you for all your amazing stories, it’s a real pleasure for me to discover them day after day ! !